Pink Tea Latte: Latte Moment | Matcha Lattes are the New Morning Coffee! Latte Moment | Matcha Lattes are the New Morning Coffee! have you had a matcha latte before? If not, please go out and try one because they are absolutely amazing! My smart list on all the Matcha Latte spots across the lower mainland can now be found at YP Vancouver. A little back story on why I named my blog Pink Tea Latte! Matcha Lattes are also known as Green Tea Lattes by some. They are used interchangeable by most. I like Matcha because I just love pronouncing the word hehe. Since Green Tea Lattes are my all time favourite go to hot beverage, I decided to swap the green for pink and voila --> we have Pink Tea Latte. How did I become so obsessed with matcha lattes? I am restricted in the amount of caffeine I can have due to its effects on the daily medication I take. Even a decaffeinated beverage has a fair bit of caffeine in it, but if I need a pumpkin spice latte fix, then I would have have it at least decaf. One day, a barista suggested I try their green tea latte. Needless to say, it was love at first sip! Matcha Lattes are not as widespread as the classic latte or coffee beverages are. However, do not fret, matcha is taking Vancouver with a frenzy. One example has to be Basho Cafe! 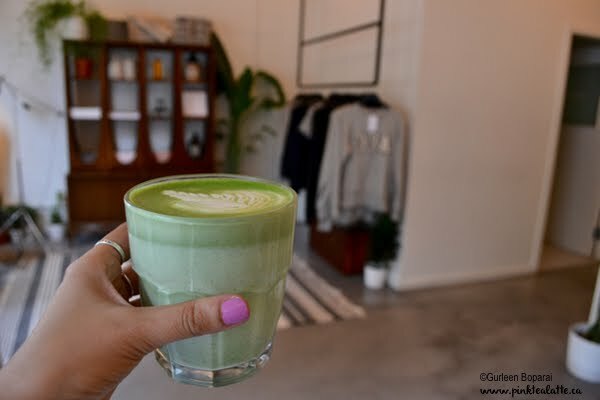 It is a cafe located on East Hastings in Vancouver solely dedicated to bringing you everything matcha. Not just matcha lattes, I am taking about matcha shakes, matcha madeleines, cookies, pastries the list goes on! If you are a serious matcha lover, you need to go to Basho now! My favourite place for a classic unsweetened pure matcha latte is actually from 33 Acres Brewing. I know, a little odd since they are expert craft beer brewers. But they make an excellent matcha latte. And I love how they serve it in a clear glass handles mug. I just love wrapping my hands around it and letting it warm me up head to toe in between my bites of their to do die for weekend waffles! Other go to favourite places for my matcha fix is Le Marche St George, Cafe Medina and Prado. Especially Le Marche since their whimsical atmosphere makes me feel like I am a princess sitting under the iconic Eiffel Tower. Plus they have the same string globe lights as me! A new place in town is the Buro! It is a cool hip new cafe in the bustling historic area of Gastown. It sits at a point of three streets crossing giving this cafe a unique triangular shape! Matcha Lattes -- Thumbs Up From ME! A great place to get work done! Small Victory does serve up a great matcha latte, but they do not have wifi there. I generally enjoy my matcha lattes while I am doing some work. And it is not mind blowing enough for me to just go there to sit and sip a latte. Let me know where you get your Matcha Latte from in Vancouver!!! As I must try it for myself! Hehe!